Please join us for Lunch at Tempe Sister Cities Hackett House during the week of April 15-19 as lunch will be presented by the Wildflower Bread Company and Hackett House. 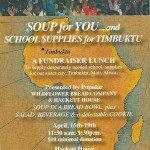 Each day during the fund raiser from 11:30 a.m.-1:30 p.m Lunch will include soup served in a bread bowl plus salad, beverage and a delectable cookie. 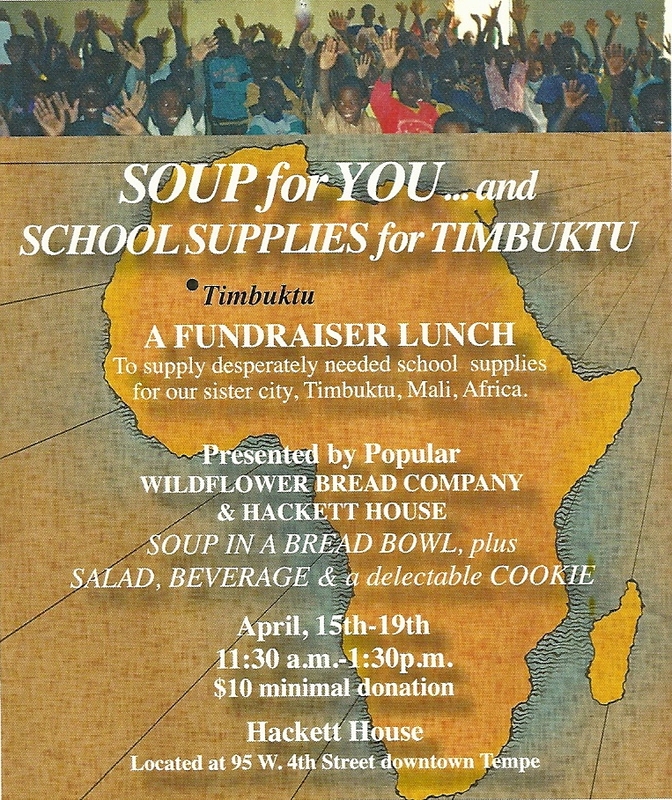 "Our Soup For You...School Supplies For Timbuktu" Fundraiser proceeds will be used to supply desperately needed school supplies for our sister city Timbuktu, Mali, Africa. The cost is a $10 minimal donation. Hackett House is located at 95 W. 4th Street in downtown Tempe. "1 FREE hour parking at Hayden Square Garage"